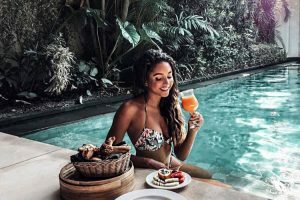 Follow Australian babe @kristinamendonca to some of Bali’s most iconic villas in Canggu & Seminyak – think uber photogenic boho interiors, lush tropical gardens and luxury private homes. Puri Beji, Canggu was the first place my boyfriend and I stayed at. We didn’t arrive until very late at night so we could not see too much. In the morning when we woke up we were stunned by how beautiful it was. Behind our bedroom was our stunning bathroom, it had a rustic and industrial look but yet still gave off that balinese feel that I loved. Our balcony had numerous green vines that dangled over the clear blue pool. We walked down the timber floating stairs to the open dining and lounge room where delicious breakfast was served for us. The dark brown 12ft wooden door which entered into our villa was so beautiful. Overall Puri Beji in Canggu was a beautiful stay, the staff were all kind and welcoming. I would love to return there once more and would recommend everyone to stay there. The Dusun Villas in Seminyak was almost like a small village in itself, it was huge! Everyone had their own villa which had a brown wooden Balinese door out the front. We were excited to open the doors to see what what The Dusun had to offer us and felt immediately at home, as if the small village was all ours. We walked over the square tiles surrounded by small black pebbles into our living room and kitchen. Everything was so amazingly open, there were no walls dividing the outdoor area to our open living space. We then entered our bedroom which had a beautiful bed with see-through curtains draped from the top. The bathroom was very spacious, it had two basins which I loved of course, as I then didn’t have to share haha. At night we ended up going literally next door to the famous Motel Mexicola restaurant for dinner and a few cheeky drinks, it was so handy staying so close to one of Bali’s best restaurants. Overall I give The Dusun a 10/10, with the extra points being for how open and spacious their villas felt. The staff were so sweet and could crack a few good laughs with them. I had a very nice stay at the The Dusun Villas in Seminyak. TAC tip: Shop your copy of Hungry in Bali now to receive free tacos at Motel Mexicola & 46 other venues. 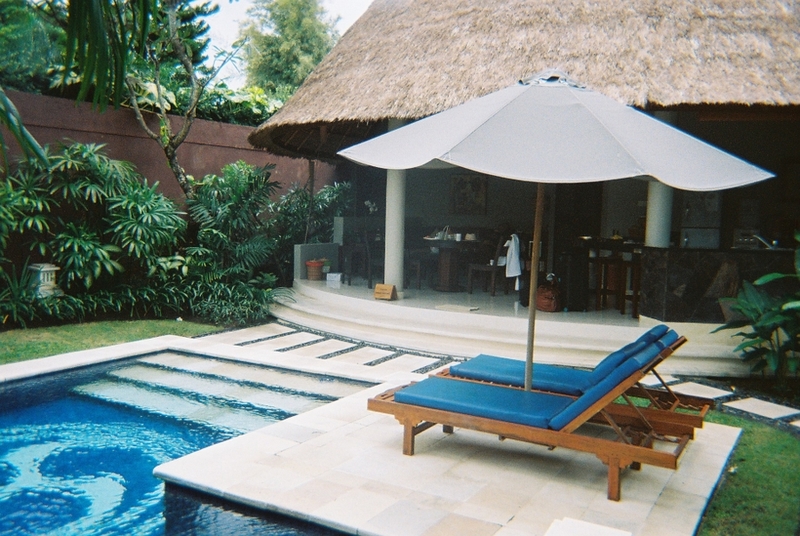 Once we got to Hu’u Villas we shocked by how central it was to everything in Seminyak. It was tucked away behind the popualar restaurant Sea Vu Play. There were a few villas which all lined up with a beautiful pathway out the front of each. The pathway had the greenest plants on each side, so alive and green they were almost touching you! We walked into our villa through the thick wooden door and opened up to our beautiful kitchen and dining room with the view of our turquoise coloured pool. We soon realised our Hu’u villa was two-storeys! Upstairs had two-bedrooms, our bedroom had the most amazing bathroom and bath tub ever!! My boyfriend and I then of course had the biggest bubble bath in the world. The bedrooms were very private, almost too hehe. 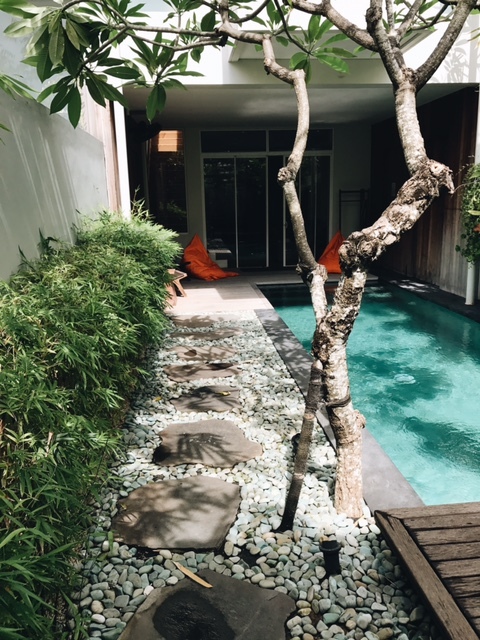 Our private pool at Hu’u Villas in Seminyak had a side-ledge with stunning green vines dangling down onto it. On the other side of the pool it had amazing big stepping stones surrounded by cool plants, the little sun aking deck had the most comfortable big bean bags that you could easily spend the afternoon in reading a book. 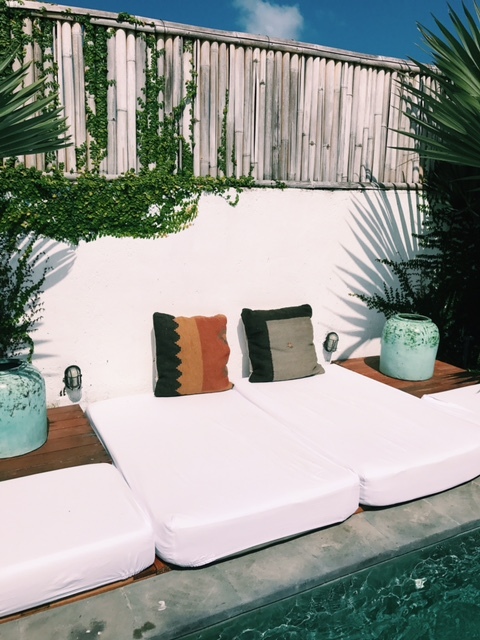 Overall Hu’u Villas, Seminyak was a very humble stay and I would highly recommend it. TAC Tip: Get 2-for-1 cocktails at Sea Vu Play with Hungry in Bali – The Ultimate Bali Dining Guide. Fella Villas was an exceptional stay, as soon as my boyfriend and I walked through the white entering doors I was blown away by the lush green grass and sparkling blue pool. The whole design of the villa was amazing, it had beautiful Persian rugs and pillows that would swallow you up when you laid down for a tan or nap. It had great functionality with all bedrooms, having beautiful rustic exposed bathrooms to the amazing Balinese elements, such as open showers and plants everywhere, it was breathtaking. The pictures hanging on all the walls and interior design were so impressive and well thought out. We woke up to our beautiful and sweet maid, who had cooked us up a delicious breakfast in the most amazing kitchen ever. Our kitchen was crisp white with wooden draws and fresh greenery all through it. After we finished breakfast we went on to have an utterly most relaxing sunbake on the white day beds next to the pool that felt like we were laying on clouds. The day beds looked back at the whole of Fella Villa and was just speechless. To the left of us we had a relaxing hammock, in front of us we saw our pool and the green vines with white flowers hanging over the roof of our outdoor living area and kitchen, and to the right of us we looked at the rest of the villa and the front ‘yard’ which was all green, it had green Balinese plants and trees with a rich green grass covering the floor. The location of Fella Villas in Canggu had a rice field out the front which gave it that extra Balinese feel. 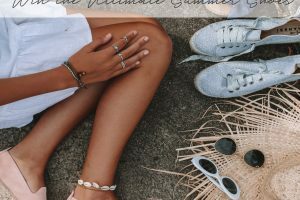 It was so easy and convenient to get around, taking less than five minutes to ride to the beach and was also so close to the best cafés in Canggu. 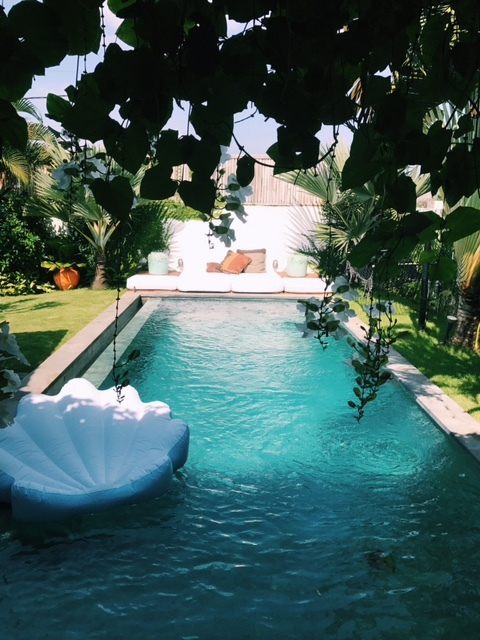 Overall Fella Villas in Canggu was my favourite, the whole villa and design was amazing. I was literally speechless when I saw the villa. Loved everything about it and would definitely go back there any day, anytime! 100/10!!! Love love love!